Bashir and O'Brien assist an alien race in dismantling their biological weapons program, but as they finish, they are attacked and O'Brien is infected. O'Brien demonstrates his combat experience early on. It's a good job by the writers utilizing an aspect of his character that's been pretty dormant thus far. I'm pretty sick of the fake death reactions on Star Trek, where the crew mourns for someone who we know is still alive. They happen way too often, and they don't have any punch unless the audience is fooled too. Granted, every once in awhile, the writers find a clever use for the trope, as in TNG's "The Next Phase," but this instance is nothing like that. They do a good job distracting the audience from the fact that O'Brien is infected. I had practically forgotten about it until O'Brien went to get a blanket. I don't know. The fact that he's drinking coffee in the afternoon is pretty damn thin. It would warrant a little extra digging to see if there's any evidence of tampering, but it seems like a huge leap to go from that to Sisko being 100% that the suspicions of a grieving widow are absolutely correct and going to confront the people responsible, risking a diplomatic incident by making pretty bold insinuations. I think the writers could have come up with something a little better. So why are the Harvesters so terrible if Bashir can easily cure O'Brien, even at the brink of death? This is another good episode on multiple levels. 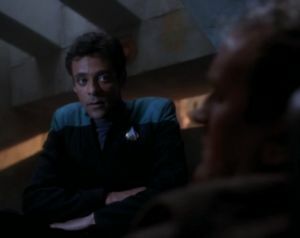 On one hand, it's the third--and far and away the best--attempt by the writers to create a friendship between Bashir and O'Brien, and it is incredibly clever to put them in a life-and-death situation that requires the talents of both an engineer and a doctor. On the other hand, this is an episode about marriage--from two warring sides of a conflict attempting to disarm their most lethal weapons in order to have peace (sounds like a lot of marriages I know) to Bashir and O'Brien discussing the merits of being married in Starfleet (it turns out O'Brien was right, because Keiko's intimate knowledge of her husband is the only thing that saves them, even though the final joke kind of thwarts that). There's even the speculative, sci-fi idea of a culture that is trying to put the technological genie back in the bottle, though the story never gets around to expounding on it very much. All in all, good Star Trek. I'm going to try to stop bringing it up, but it's amazing how often Bashir's nervous modesty comes across, in hindsight, as evidence of him covering up his big secret. The writers freely admit they didn't come up with the idea of Bashir's genetic modification until the episode in which it is revealed--"Doctor Bashir, I Presume"--but it fits so perfectly with his character that it's difficult to believe them sometimes.